I'm in the process of installing a higher flow fuel pump in my S15. When I was taking the lines off the 'fuel tank cap' I snapped the quick connect fittings, they seemed very brittle. Anyone know where I can get a replacement? And what's the proper name for them? Exactly, so is that my problem? So it's definitely not likely to be a failed wastegate? 27871R, PowerFC Djetro, AVCR (EBC), nismo 555's, FMIC, intake, 3" turbo back. It's got a PFC running base map and MAP sensor. Didn't have the problem prior to fitting new turbo. I've just fitted a brand new internally gated Garrett GT2871R into my S15. I took the car out for a test run after installing and the car hits about 4800rpm at about 14psi boost then the boost completely cuts off to -2 and the revs barely go up from there. I've checked for boost leaks but even then a boost leak shouldn't be causing the car to go on vacuum. I've even tried to over-tension the wastegate rod but it still does the same thing. My EBC is set to OFF so the car should be running off and holding gate pressure. I've got a hunch that the wastegate isn't holding up and the flap opens up and stays open which is causing the boost to drop, however, I am doubtful as the kit is brand new. Does anyone know what my issue might be!? Why HyperGear? Precision is in a completely different price bracket and for now I'm willing to give a cheaper turbo a shot, especially after reading many good reviews here. Looking to get turbo kit for my S15 and from what I've read on this thread, the Kinugawa's seem like good value. Which one of Kinugawa's turbo kits should I go for? The TD05H-18G? Also, are they straight bolt on kits? My goal is to make around 235rwkw with response being important. I'm looking for a set of S15 stock suspension (or STD height springs). 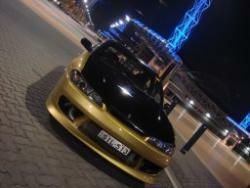 Also have S15 stock suspension with SSL lowered springs that I'd be willing to swap. Washed the car this morning by hand with a microfibre bug. 90% off all the specks are gone! I've got some of that Mequair's quik wax but I've heard that you can't use wax til a month after respray?